The hand-blown Patron bottle is a thing of beauty, and the Patron Silver Tequila is not bad either (see below for our perfect Margarita recipe). So, it came as no surprise when my wife asked me to retrieve an empty bottle from our recycle bin. What to do with an empty tequila bottle? Why, you re-fill it with home-made fruit-flavored Vodka. I’d expect nothing less from the woman who coined the word Chabernet. This time she substituted Vodka infused with foraged Pitanga (Surinam Cherry), but any edible fruit might work. In Hawaii, Guava also grows wild, as does Lilikoi (passion fruit), and Mountain Apple. In Texas, Wild Plum trees abound, as do wild Persimmon and Mulberries. The first time I encountered a wild plum tree while walking along a Texas creek, I smelled the fragrance of the fruit before I spotted the tree. The smell is indescribable and I’ve sniffed it before in wild fruit like the Pitanga. How amazing that such a fleeting perfume can be captured and savored in a Vodka infusion. Conveniently, wild yeast grows on the skin of the plum making it perfect for handcrafted wine or your own sourdough bread starter yeast (but that is another story). In the Pacific Northwest, wild berries are our choice – blackberry, raspberry, currants, goose berry, and huckleberry – just to name a few. I recall a sweet golden raspberry that we foraged in Oregon and its color and taste infusing Vodka might be a clever alternative to Chambord. In any case, wild fruit is a renewable and healthy resource. Impress your guests by hauling out your own homemade hooch then offer a toast to their good health. Recipe for Surinam Cherry Vodka is here. In our typical Chabernet style, we replace expensive spirits with inexpensive but good quality Costco Signature Vodka. By the way, we don’t add sugar or sweetener to our home-made flavored Vodka. Quote from Patron regarding their beautiful bottle. 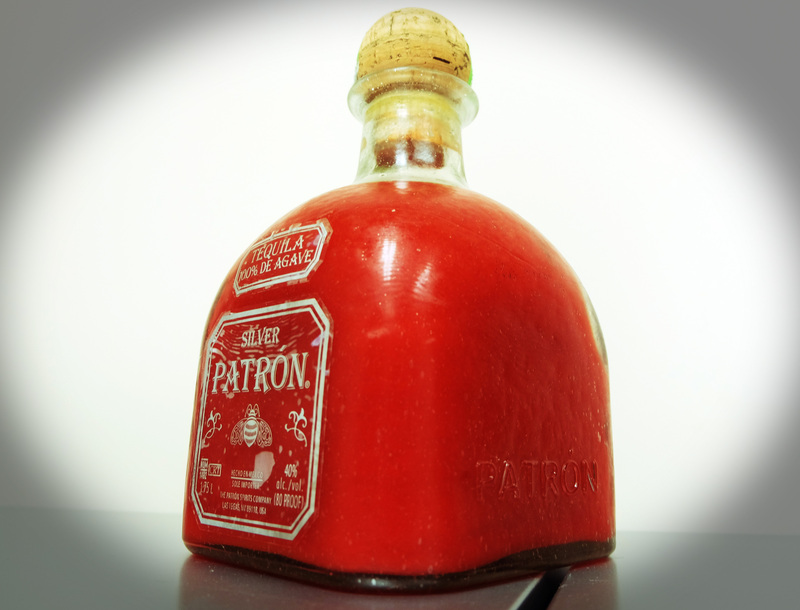 If you don’t drink Tequila, empty Patron bottles are sold on e-Bay. Inspired by the House Margarita at Uncle Julio’s in Dallas, TX (our favorite Tex-Mex chain). The Agave Syrup is a clever touch since Tequila is also made from the Agave plant. Simple Syrup may be substituted.